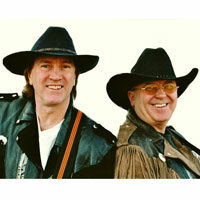 This Country & Western duo was formed in 1997 and has provided entertainment at all the major Country Music and Line Dance venues, events & festivals across the UK and Europe, being nominated twice as 'dedicated line dance act' in the Line Dancer Magazine. They have recorded 6 albums, with many of their songs entering the European Country Music charts top ten. Whether you are a listener or a dancer you are guaranteed a full evening of first class traditional to modern country music.